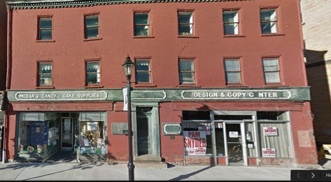 It all started during the late 1800’s at JT Rogers & Co Drug store on High Street (the main street in Waynesburg, PA. An unknown local farmer remarked to pharmacist William Allison, that it always seems to rain on his birthday, July 29th. This comment inspired Allison to keep an annual record of the rainfall on that day. William’s brother, Albert, continued recording the event. Then, sometime during the 1920’s, the record keeping was taken over by the late Byron Daily. 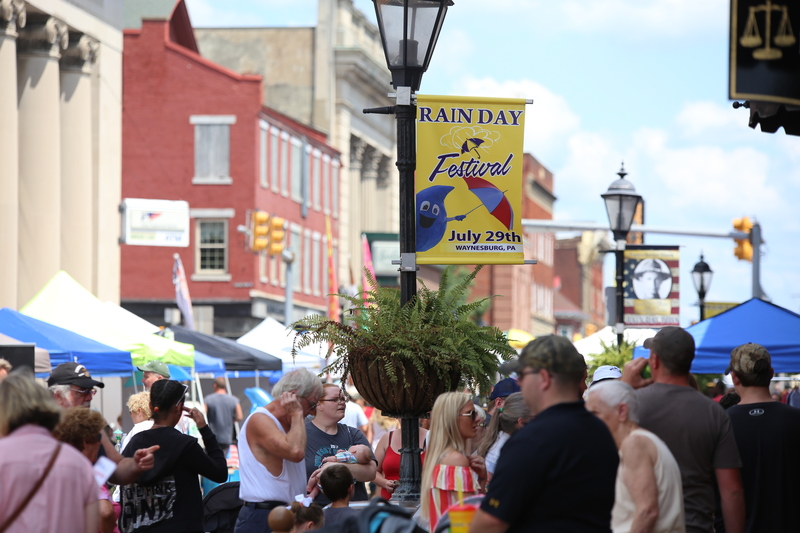 Rain Day would have remained a local phenomenon if it hadn’t been for the efforts of the late Waynesburg newsman John O’Hara, who began sending Rain Day stories to other newspapers in the 1930’s. 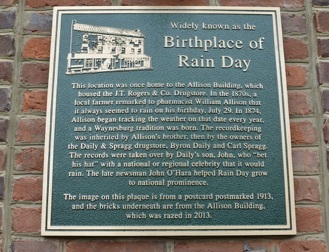 For many years, the only observances of Rain Day were a brief ceremony on the Courthouse steps, the annual hat bet between Byron Daily’s son, John, and a national or regional celebrity. Today, newspapers, TV and radio stations from around the world contact Waynesburg every July 29th to learn if it has indeed rained. In 1979, the Waynesburg Borough Special Events Commission was created to hold a special celebration on July 29th each year. That same year, the Waynesburg Area Chamber of Commerce held the first annual Miss Rain Day Pageant. In the early days the celebration was varied; one year the main street might be closed with a carnival setup through the center of town, complete with a ferris wheel, carousel, games and food. The next year there might not be more than a mention of Rain Day in the local newspapers. The Special Events Commission was to bring continuity to the event and has brought both national and international fame to Waynesburg. In 1979, an annual street festival that continues to this day was born. In 1985, Willard Scott the weatherman on NBC’s Today Show was the bettor who gave Rain Day the most notoriety. Willard, being a weatherman, the phenomenon of Rain Day was of special interest to him. Mr. Scott not only mentioned Waynesburg on Rain Day, but talked about it the day before and the day after. Although it didn’t rain for Willard’s year, he sent us a beautiful Stetson cowboy hat. In 1992, the commission bet the town of Niceville, Florida. A resident there was a former Waynesburg resident, who thought that Niceville and Waynesburg were perfect opposites. Of course, Waynesburg won a hat from the Florida town. 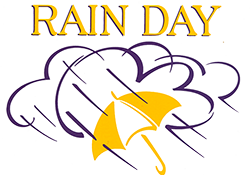 In 2003, the Chamber of Commerce created a new non-profit entity, Rain Day Scholarship, Inc. with the sole purpose to plan and execute the pageant. Among the activities sponsored by the Special Events Commission on July 29th is a street fair in the heart of town, live entertainment on the courthouse steps, arts and crafts booths, hometown food booths, children’s games and assorted other diversions – including an umbrella decorating contest. Best of all, the admission is free!